Dr. Joerg Mayer grew up in Germany where he received his primary education. He went to Budapest / Hungary to study veterinary medicine shortly after the “iron curtain” fell. During his studies he was fortunate to be able to work with veterinarians in South Africa and Namibia for 6 months. He always had a strong interest in exotic animal medicine. After he received his doctoral degree from the University of Budapest/Hungary, he went to the USA for an internship in ‘Zoological Medicine and Surgery’ at the Roger Williams Park Zoo in Providence, RI. At the end of the internship he was part of a research team to study wild tree kangaroos in the rainforest of Papua New Guinea for 3 months. After this exciting experience, he went to the Royal veterinary College in London / England to study for his Masters of Science degree in wild animal health. The masters project which focused on lead toxicity in the common loon, brought him to the Tufts Wildlife Clinic in the USA. There he was hired to serve as a clinical associate professor and as the head of the clinical service for exotic animals. After 10 years at Tufts University he moved to Athens, Georgia in 2010 to take the job of Associate Professor in Zoological Medicine at UGA. 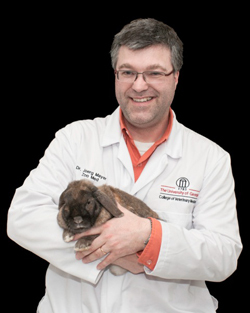 He lectures regularly at large national and international conferences on all aspects of exotic animal medicine. Dr. Mayer qualified with the first batch of specialists in Exotic Companion Mammals as a Diplomate of the American Board of Veterinary Practitioners, in addition he is also a Diplomate of the European College of Zoological Medicine. He served as the president of the Association of Exotic Mammal Veterinarians from 2010-2012. Since 2012 he is also an International Fulbright Specialist in Zoological Medicine. Dr. Mayer published many scientific articles, book chapters some of which have been translated into French, Spanish and Portuguese. His latest book the “Veterinary Clinical advisor for birds and exotic pets” was published in early 2013 and contains over 750 pages.